The first thing Port Germein farmer Brad Dennis thought when his ute stalled in the middle of a bushfire was "I'm in a fair bit of trouble here" Brad who was 21 years old at the time was a CFS Volunteer desperately tried to get away from the flames spreading across Pinery in the mid-north on November 25th 2015. A friend of Brad called and told him about a fire next door to his neighbour's property. "They asked me to fill up the ute with water tanks and come down". When Brad arrived, he moved to the passenger seat so his friends dad could get behind the wheel to drive closer to the flames, but that's when the car stalled. "I got out and into the tray. It was windy, so I wet my clothes down but it was still pretty hot. All I could think was to run, so I ran through the fire. My life flashed before my eyes and I just kept running and screaming"
Eight days later, Brad was woken from an induced coma in the ICU at the Royal Adelaide Hospital. He suffered burns to more than 50% of his body. Tragically the driver of the ute, didnt survive. About three weeks after the event Brad got the ok to make the long journey back home to Port Germein. Brad recalls "I remember every bump of that drive - it was pretty painful"
The CFS Foundation helped enormously with Brad's recovery. "They went as far as offering Mum a place to stay while I was in Adelaide recovering. They have just gone above and beyond" Brad says. Many people, including friends, family and the CFS Foundation, have aided Brad’s recovery at each step and he is very grateful for the encouragement, best wishes and support from his community. 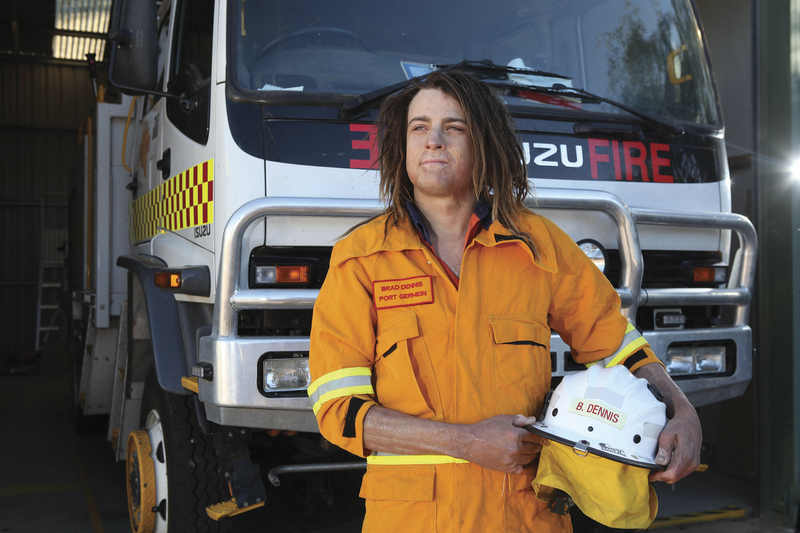 Within a year of his injuries, Brad was back out on the ground fighting fires, albeit much smaller fires.